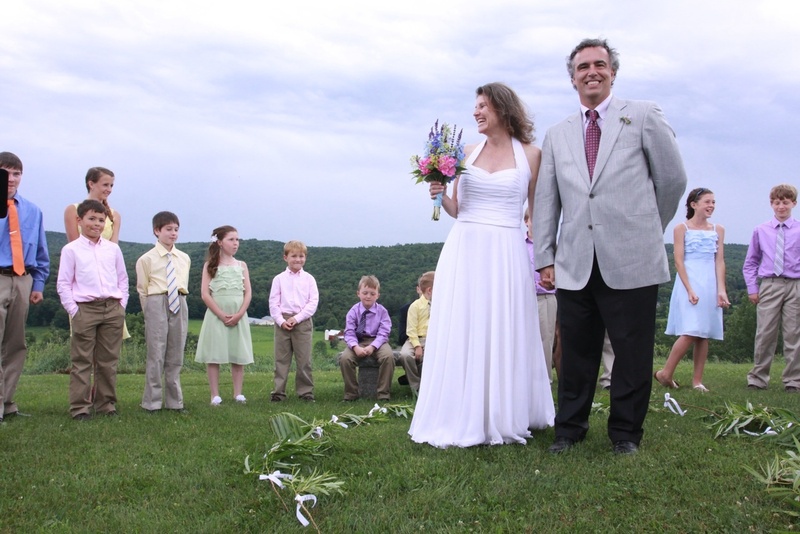 It was just about time for the ceremony to begin, when dark clouds, thunder and lighting rolled across the expansive skies at Alyson’s Orchard. We waited for the storm to blow over. The friendly staff dried off the chairs. The wagon delivered the bride and groom and their 20 beautiful and handsome nieces and nephews to the ceremony sight. 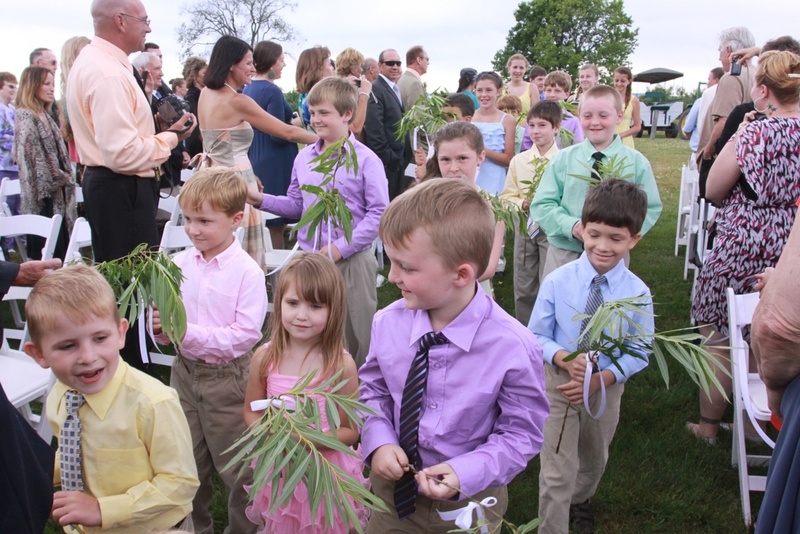 In their pastel clothes the children processed down the aisle with willow branches and formed a circle of love in which the bride and groom made their vows. Simply adorable. 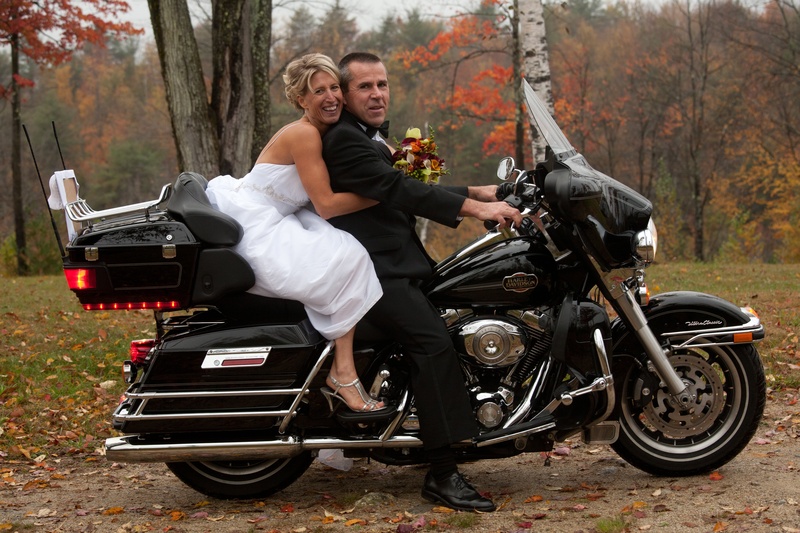 Wendy and Jimmy ride off into their future as husband and wife! …from the ceremony, as Wendy and Jim envisioned their future life together, and shared a third sip of cider from a “Common Cup”. I’d been told to turn right off the country road and drive through the open “bar way” gate. The gravel road curved up a fairly steep hill and when I reached the top the setting took my breath away! 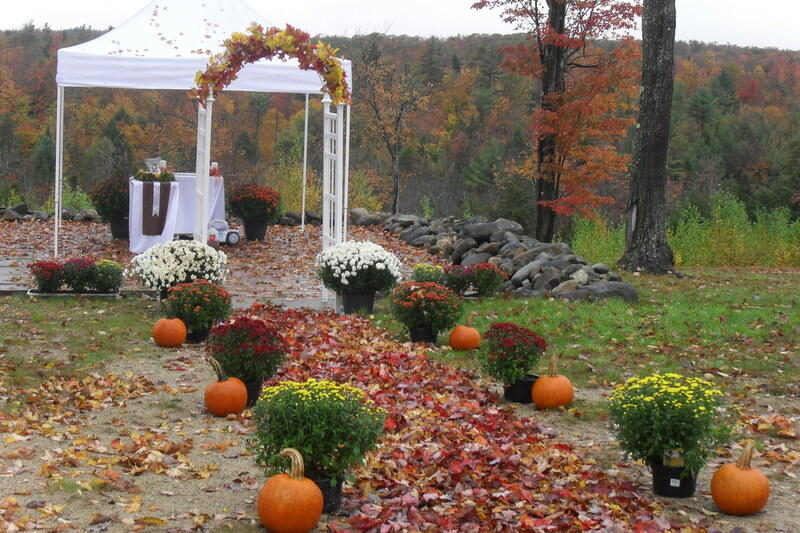 Jim and Wendy created a beautiful ceremonial space on their friend’s land, overlooking Mt. Monadnock in Jaffrey, New Hampshire. Although the mountain was invisible behind thick clouds, the ceremony and the retelling of their love story evoked its majestic presence. 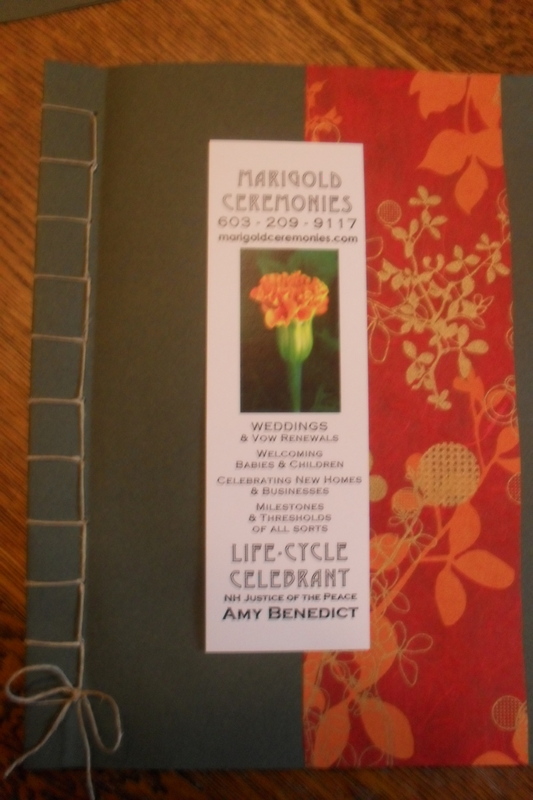 Like.the colorful carpet of leaves that they walked through hand in hand, I used red and gold paper and bound their keepsake ceremony with an earthy twine. Looking back, I realize we were blessed with a break in the heavy rains that fell before and after their ceremony that day, and that this loving couple created a special radiance all their own! 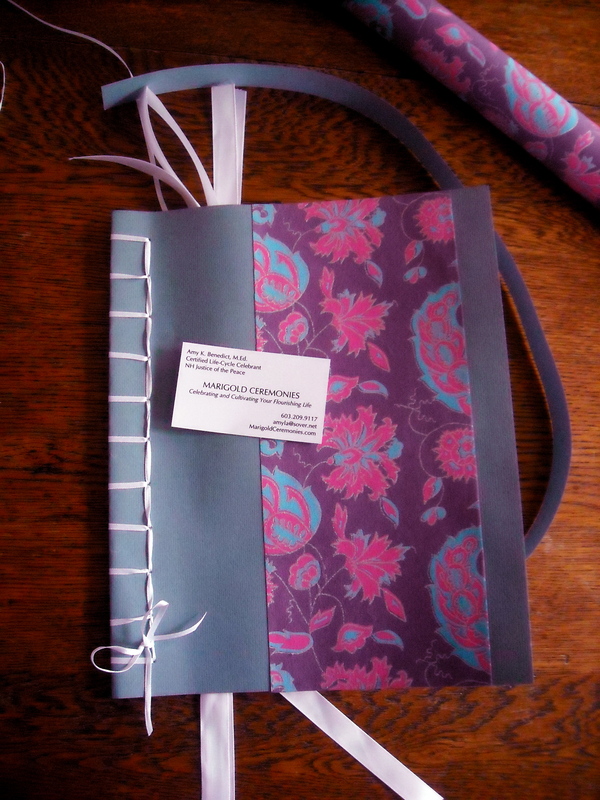 Thank you so much for the beautiful bound keepsake! It was done beautifully, as beautiful as our ceremony that you created and performed. Wow! 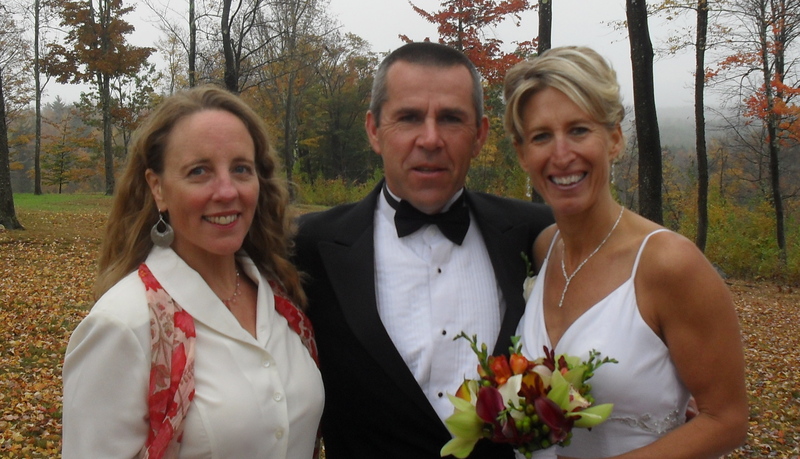 Both Jimmy and I were blown away at how wonderful our wedding day was and the FABULOUS job that you did. It was more than we could have ever imagined!!! 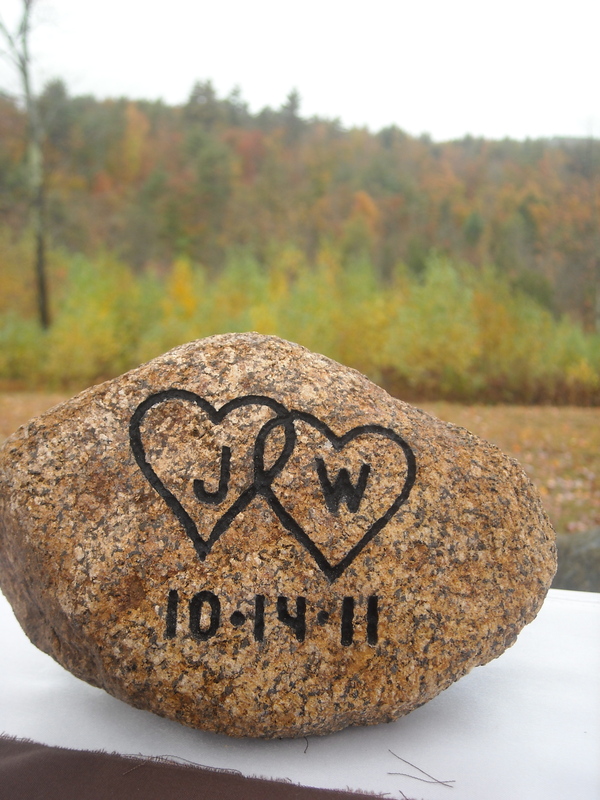 The picture you sent of our oathing stone and the way it kind of mimicked the outline of Monadnock was so neat. Thanks so much for all that you did to make our wedding so special and wonderful! I sing your praises to all that I have told about our wedding!